If you’re a fan of time attack, then what a time to be alive! A FWD Civic owns the overall North American time attack record, the Unlimited AWD record was just broken—twice—by two competitors who appear to be charging up on that record, and a ton of new cars and drivers are entering Limited and Street class competition. Oh, and there’s an all-new, world-class annual event in the works, right here in the good ol’ US of A. Yes, the overall record still stands, that blistering 1:37.308 pass clocked by William Au-Yeung in his Vibrant Performance ninth-generation Honda Civic during Pro-Am competition at Buttonwillow earlier this year. But in contrast to last year’s Super Lap Battle, where the Unlimited AWD record didn’t budge (a 1:38.967 set in 2014 by Jeff Westphal in the GST Motorsports Subaru 2.5 RS), this year it finally fell, first by Tom O’Gorman in the Professional Awesome Mitsubishi EVO VIII, with a 1:38.454 clocked early on during the event’s second of two days. You may know Tom for having handily won Pirelli World Challenge’s TCA-class championships for 2018 from behind the wheel of his TOMO Racing Honda Civic, or for his guest driving stints at this year’s Gridlife festivals. When we had a moment to chat at the event, he admitted that this was his first time driving a car this powerful, let alone in AWD trim at Buttonwillow. Right after that chat, he broke the record. But some other competitors came out with their sights set on the record, and while “Tom-O” and the Pro Awesome crew were laying it down, other forces were building. 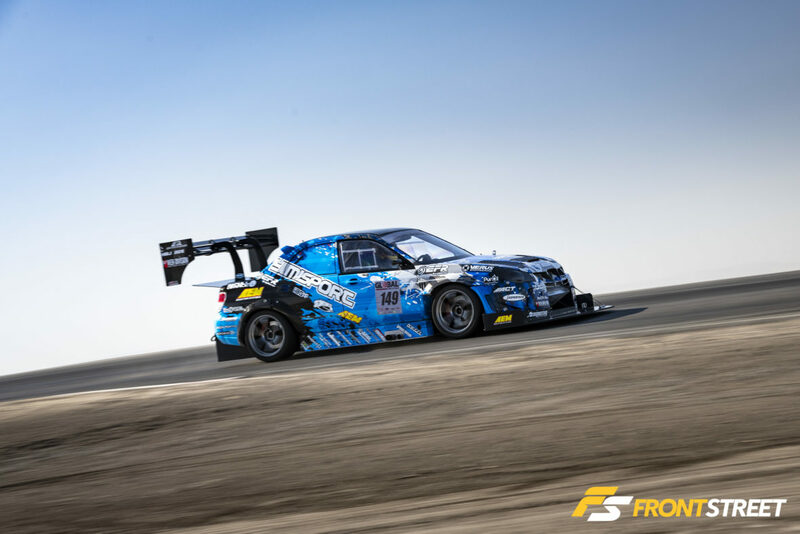 The first session of the first day saw the debut of the Can-Jam Subaru WRX STI, with driver Richard Boake clocking a quick 1:42.356—before breaking in the second session. By noon the second day the team was back up and posting a 1:42.185, but then encountered a braking issue that sent them through the left-field fence. Somewhere in this mele, the Pro Awesome EVO also encountered some mechanical issues, Mark Jager and his amazing Subaru WRX STI showed up, but broke, David Haagsma and his H&M Motorsports GT-R had gone no faster than a 1:41.520 (before also seeming to have broken), and last year’s winning EVO IX of Andy Smedegard and RS Motors laid down only one run: a 1:51.848. But just when we were beginning to wonder if Unlimited AWD-class competition would fizzle out, the Can-Jam Subie sparked to life and belted out a 1:40.077, in the second-to-last session of the day. The race was on, both literally, and to the teams thrashing to complete repairs and defend their standings before the day ended. The energy in the air for the final session was nothing short of lightning on a racetrack, as the Professional Awesome EVO VIII, Can-Jam Subaru, and RS Motors EVO IX all took the start, however the Professional Awesome EVO pitted before completing a lap. Then the Richard Boake/Can-Jam car went 1:38.281, breaking the record set earlier that day. But don’t forget about Smedegard and the RS Motors EVO IX, who laid down a tire-smoking, splitter-sparking 1:40.512, which booted David Haagsma and his GT-R off the podium! Finally, the checkered flag fell, and none of us could believe the amount of drama that unfolded in the final minutes of the once-a-year, two-day event. And that was only Unlimited AWD competition. There were 11 other classes that competed this year, so we’ll make the rest of this short. With 12 competitors, we knew Unlimited RWD competition would be anyone’s game. But also with a grid comprised of a Porsche 911 GT3, Mercedes-Benz C63 AMG, Corvette FRC, Dodge Viper, and Challenger Hellcat, we didn’t expect it to be won by nearly three seconds—and by a Miata! Regardless, Emilio Cervantes and his No. 949 SuperMiata handled that business with a stout 1:44.841, ahead of next-closest finisher Rhett Panter in the flared No. 1 Honda S2000. Taking third was Jason Sharek in the No. 63 C63, who might’ve gone a whole lot faster if a faulty shift solenoid hadn’t failed while he was still dialing it in. It might be some time before another FWD competitor steps up to Au-Yeung’s record-setting 1:37.308 time (seriously, how did he do that?). The Unlimited FWD class at this year’s final event saw only two entrants: Edo Stepanyan, in the No. 78 Edo Motorsports CRX Honda Challenge car, with a 1:58.273, and Alex Peng, in Ryan Novak’s No. 310 EK9 Honda Civic winning the day with a 1:51.435. With all the right ingredients to be a serious contender, we’re wondering if Novak’s Civic might soon become our next record-setter. This is a class that’s been giving us a lot of excitement recently. Open mainly to racecars (with the odd hot rod or kit car), it’s seen a Lamborghini Super Trofeo and a Porsche 911 GT3 almost clock the overall quickest time of the event in recent years. This year Elliott Skeer and the No. 65 Savvy/SP Motorsports GT3 Cup car came close once again, just missing the number but improving on their best time from last year to claim the class win with a 1:41.546, over the 2:05.930 of Roger Hocking and the No. 6 GP Roadster GP-GTR. Eleven cars entered and many ran very close times, one-upping each other as the two days wore on. In the end, time attack vet JC Meynet and his No. 130 Subaru WRX STI rose to the top with a 1:47.604. Just barely trailing him was Cody Miles and his formerly-Street class Subaru WRX STI with an impressive 1:47.836, while just behind him was Steven Chan and the No. 720 Nissan GT-R with a 1:48.210. Lots of growth and action was seen in Limited RWD, too. In between shaking down his own turbo K24-powered NSX, Amir Bentatou drove his bud Ryan Castro’s V8-swapped No. 107 E36 BMW M3 to a team-best 1:47.277. But it wasn’t quite enough to edge out Ryan Passey and Goodwin Racing’s No. 13 V6 Mazda Miata, who reset the high-water mark and took the class win with a 1:46.857. In third, was Formula D Pro 2’s Adam Knapik in the No. 56 SP Motorsports / Savvy Porsche 911 GT3 with a 1:48.867. Limited FWD was, we’ll say, “fun.” With winning times slightly slower than Street Class competitors (more below), and only two sub-two-minute entrants, there was a lot of opportunity left on the table for next year. In first place was Tim Kuo driving the Evasive Motorsports FK8 Honda Civic Type R to a 1:56.447, followed by the turbocharged No. 76 Honda Prelude SH with Cory Wells and Will Drees switching off behind the wheel, clocking a 1:57.741 whilst battling constant mechanical gremlins. In third? Our man Dai Yoshihara, in the not-so-serious No. 999 “Team Dai” DC2 Integra Type R with a 2:02.490, who also piloted the No. 95 Spoon Sports S2000 (more photos in the gallery below). Perhaps one of the best battles of the day went down in the hotly competitive Street AWD class. Defending champ Markos Mylonas and his No. 555 Snail Performance/IAG Subaru WRX didn’t break his personal-best time this year, but did clock a quick 1:49.563. Johnny Hernandez and his No. 5 Lido Labs Subaru WRX STI also couldn’t break Mylonas’ record, but they did outdrive him this time, clocking an extremely close 1:49.237 to take the class win. In third, Mylonas’ teammate Sally McNulty ran a 1:53.498 in her No. 412 WRX STI, which was clocked before the car suffered an unknown issue. By far, the most popular and most competitive class this year was Street RWD. A full 17-competitor field entered, with 11 of them separated by only about two seconds. Ahead of that pack by almost two seconds was Dustin Dessero in the Rockstar Garage No. 2 Honda S2000, with a 1:50.478, ahead of Sonny Watanasirisuk and the 1:52.182 he recorded in the 949 Racing Ford Mustang GT350R. Flanking the Ford was another Rockstar/S2000 hotshoe, Chris Elders, who lapped a quick 1:52.703 in the No. 29 car. Steven Kronemberger and his No. 429 FK8 Honda Civic Type R has been cleaning house this year, in VTEC Club competition along with various other track days we’ve caught him running. So, it came as no surprise that he followed suit here, winning Street FWD with a 1:54.829. What did surprise us was Rob Walker coming so close to that time with very little experience in an all-new build, the No. 8 Evasive/HKS FK8 Honda Civic Type R, with a 1:55.726. It was another FK8 that claimed the third spot, this time the No. 110 United Speed Racing car of Chinchi Chiang and Jason Owens, with a 1:56.820. The recent action from Canada’s FWD-ers, the release of the FK8 Civic Type R, the falling price of used S2000s, some great engine management and traction-control tech hitting the market, and several other factors really seem to be driving progress and motivating more time attack competitors to enter the fray. The only issue we see is getting all the big players together in the same spot. But fear not, at this year’s Buttonwillow Finals and Super Lap Battle, GTA leader Jason Deinhart unveiled plans to create an all-new, annual, time-attack Battle Royale at Austin, TX’s renowned Circuit of the Americas, beginning this February. Will it be the catalyst North America needs to show the world the true potential of our competitors here at home? Will those competitors jump at the chance to set all-new records at the world-class venue and F1/IMSA/World Challenge/MotoGP/soon-to-be IndyCar circuit? We’ll know soon enough.